Art lovers are constantly on a deep search for the true definition of Art, yet it can encompass a variety of things that go beyond just paintings on museum walls. Art is all around us, it is omnipresent. My father, a contemporary abstract artist, has always been my biggest inspiration. He helped me tap into my artistic side and to learn to appreciate the world of Art around me. As a family, we love visiting galleries and art museums. From this, my love and passion for Art grew greater each day as I got older and the beauty of Art never ceases to inspire me in life. I have always wanted to talk about Art but I didn’t know where to start! It’s something I love and it’s become like a filter through which I view life. It exists in what I wear, in how I how I choose to write, style my furniture or cook my food. It’s in everything. It’s very much possible to find Art in the smallest of ordinary things. There are so many new interpretations of everything that surrounds us. We can be moved by a cactus in a ceramic pot, a butterfly on a petal, and at times one doesn’t need to wander far to find a city blooming with vibrant art murals, graffiti, a street performance and various delightfully spontaneous art installations. At the end of the day, art serves as an unorthodox way to add life and fascination to everyday things and situations. The other day my dad and I were looking into an empty cup of coffee, and we saw the leftover stains forming a drawing of mountains and the sea! It’s about noticing something unexpected in everyday life. If you think about it, everything around has been created by someone with an artistic vision to some degree. Art can be expressed in endless ways. Have you ever looked at any piece of art and instantly related to it? Understood it? Felt touched by it? On the other hand, how many times have you misunderstood a work of art? Felt it was pointless? Art is more than merely pretty imitations of nature or faces. To most people art comes down to beauty, an aesthetic that’s pleasant to look at on the walls of your living rooms. While we do admire this quality of Art, sometimes it is taken for granted that art is in fact omnipresent and has been for all of human history in all aspects of life. How many times have we stumbled upon “the art of this” or “the art of that”? Personally, I do look at the works of artists like Malevich’s “Black Square” or the scribbles of Cy Thombly, that cost millions. I’ve always believed Art is about mastering something. Paintings, literature, music or whatever it might be, should be valued on skill, technique, style and possess some kind of beauty. For instance, an artist like Cy Twombly’s seems to miss the mark. It looks like a jumble of scrawls with no clear message, a finger-painting drawing made by a child. I find it very challenging to understand this type of art. But the fact that I’m trying to understand it, surely means it had some kind of effect on me which is the intention of pretty much every artist. He was trying to convey something. Maybe he tried to create something that didn’t comply to the traditional definition of art. Perhaps art just “exists”. There will be those who like something and those who don’t. After all, it’s supposed to be wild and imaginative, and simply free of any constraints. What makes art beautiful is also the concept that it is a product of humans’ emotions, moods and thoughts expressed through sounds, colors, shapes, lines and images which in return evoke inspiration, motivation and imagination. For centuries upon centuries, art was used as a vehicle to gain insight into the artists’ world; their heart and mind, their vision. With every art, whether it’s a painting, sculpture, video, photography or performance, we gain a glimpse of new perspectives. Sometimes it gives us a wider scope of representation and interpretation than words do. Art speaks where words fail! Art naturally causes something to stir up in the mind. It pulls our minds into new worlds, perspectives, and even feelings. I remember visiting one particular art installation in Ljubljana, Slovenia, that evoked some strange emotions within me. This was a while back, I was probably in my early 20’s, so I can’t recall what the exact message of the exhibition was, who is the artist, or what was the purpose of it. All I recall is the “feeling” it left me with, as though it had awoken a dormant emotion. The installation was a huge box with various pathways lit in infra-red. Each corridor had a door and a peephole for the viewer to look through. You couldn’t enter any of the doors. What I saw in one of rooms was a retro TV with some static imagery and occasional random clips of unexplainable footage.There were also some plants in pots. In another room there was an old telephone and a pile of books with a vintage radio playing. Along side of the radio there were arms and legs of a mannequin. I wish I could remember more of what I saw. But after all these years this particular installation stuck with me and I still can’t find a reason for it. It was just the way it made me feel, like I had stepped into an alternate reality or something. The real catch of the art that we see in general, is that it allows us to tell stories in our minds and to escape into a different state-of-mind. In this case, the artist used this particular medium to communicate a certain concept which was quite effective. I believe that art plays an important role in society as a whole, and says a lot about it. It’s one of the biggest questions that comes to mind when we really, truly think about the value of art. In Kuwait, where I’m from, the art scene is becoming somewhat alive. I remember only a few years back, barely anybody paid attention to it. Now, there are galleries, exhibitions and artists emerging. There is no doubt a handful of talented artists left from the old generation. A rising number of young artists have surfaced as well but Kuwait still needs to drive more local artistic innovation which is currently lacking in my opinion, or maybe it is there but people aren’t embracing it enough or recognizing the deep meanings behind it, particularly the youth. Once society understands the meanings and purpose of art, it will play even a bigger role in the community. And this starts with education. It’s more than just picking up a canvas, paintbrush, splashing some colors around and calling yourself an “artist”, just for the sake of it. It’s an insult to real artists who took years to perfect their craft and signature style. It’s about connecting with people’s emotions, something that could resonate with them. But then again, it doesn’t need to be just a painting. 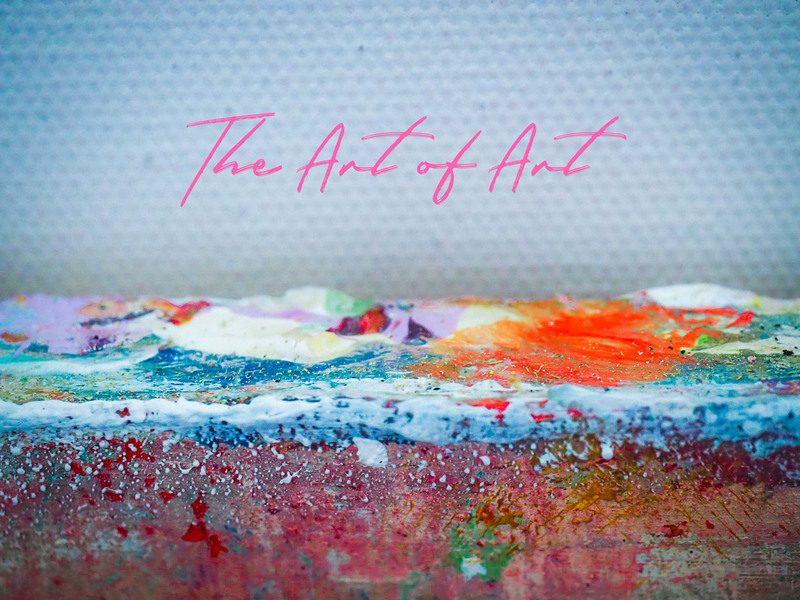 Art encompasses cultural activities, films, sculptures or even photography. It can be anything that expresses an emotion or idea. Sometimes, art doesn’t need to be something real or concrete in order to understand it. Whatever the art form, art always tries to convey some kind of energy and feeling. Does it speak to you? So I’ve reached the end of my train of thoughts and I still couldn’t define Art. I personally think its a figment of our imaginations. Perhaps it doesn’t need a definition. Let it be free, with many meanings and interpretations. That’s the beauty of it!